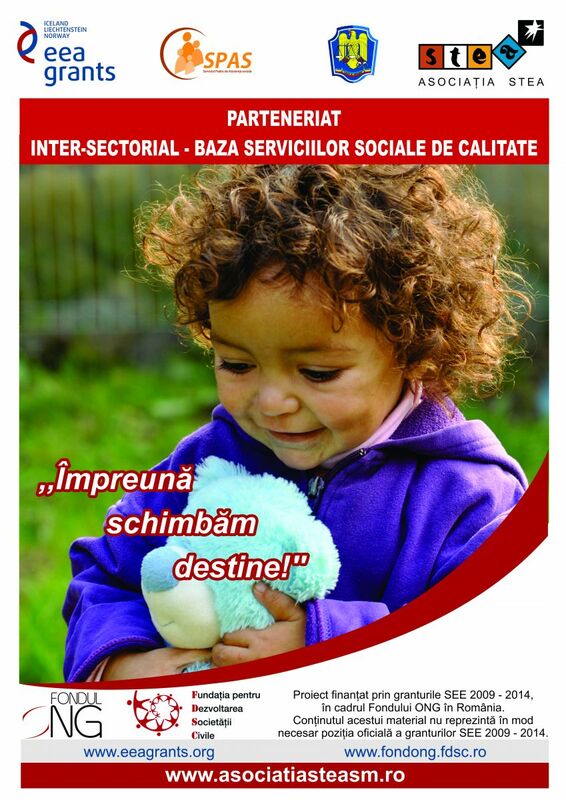 Stea Association, în partnership with the Social Public Servicies of Satu Mare, the Local Police of Satu Mare and the Direction for People Record of Satu Mare, implements within the period of 16 Mai 2014 – 30 April 2016, the project entitled „Inter-sector partnership - the base for quality social services”. The project is funded EEA 2009 - 2014 grants, under the NGO Fund in Romania. The project budget is 211.326,61 Euro, of wich 186.160,36 Euro represents the grant and 25,166.25 EUR is the contribution of Stea Association and its partners. 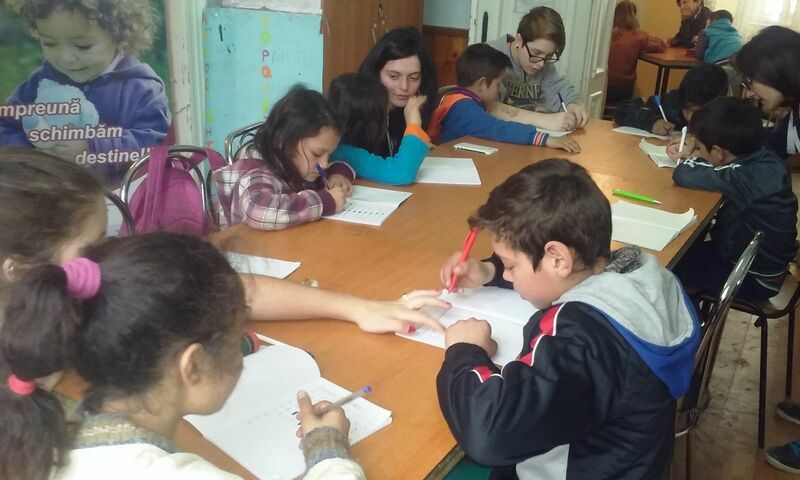 The overall objective of the project is facilitating access to social and basic services for disadvantaged people (children and youth at risk, homeless, people who are experiencing difficulties that may lead to social exclusion) in Satu Mare. Developing skills among staff and volunteers to develop the organization. 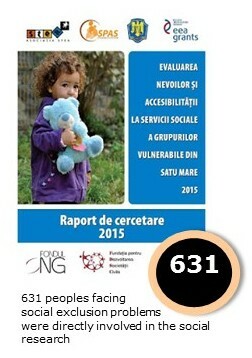 There are 487 direct beneficiaries (over 80% are of Roma ethnicity) facing major problems that are obstacle to their social inclusion (140 street children and youths; 35 homeless peoples; 222 people facing difficulties that can lead to social exclusion, 50 people who had committed infractions; 40 persons who practice prostitution) and 29 NGOs / local institutions. The indirect beneficiaries of the project are the local stakeholders; other NGOs providing social services and the local community. 3. local community - by promoting social action and involvement in supporting the development of social actions and active citizenship. Increasing the capacity of the Stea Association to provide social and basic services for vulnerable people meant both to develop new services and to increase the number of direct beneficiaries of the services provided through direct action in disadvantaged areas in Satu Mare, and in the Stea Association’s day center. One of the new social services, created in 2014 within this project is the mobile team. The two employees of the mobile team with occasion help from volunteers ensure a permanent intervention in disadvantaged areas of Satu Mare where persons are in difficulty. The role of this team is to inform vulnerable groups on basic and social services available in the community and how to access them, while ensuring immediate action in crisis situations. The mobile team advises and accompanies vulnerable people in achieving various steps to meet their basic needs, to improve living conditions and to enhance their social inclusion. 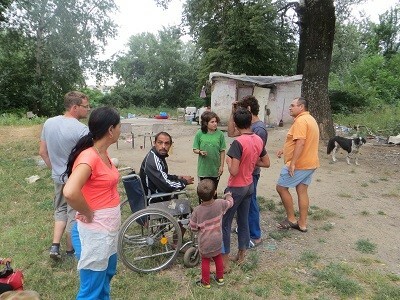 During the project, the mobile team has mapped 13 disadvantaged areas in Satu Mare and regularly monitored the situation of marginalized people. Quarterly updated mapping of these areas enables the mobile team to identify and respond promptly to the basic needs of people in difficulty. Knowledge of specific areas, information about basic needs of people in difficulty and transmission of current data to the local institutions and NGOs, facilitated the access of these peoples to social benefits and services. - a common database with information about people living in the streets and in disadvantaged areas, and their specific needs. - 210 people informed and advised through the actions of the “Caravan of Friendship” that took place directly in the disadvantaged areas. - 59 children and young people have acquired communication skills, knowledge in various domains and basic skills to use computers. - 104 children and young people were counseled to reduce risk behaviors: alcohol and drugs, begging, prostitution, delinquency, etc. - 76 young people have developed specific socio-professional integration skills: awareness of their potential and skills and correlation of these strengths with offers on the labor market; skills required to seek an employment; making various steps for obtaining an employment (resume, cover letter, medical requirements for employment, etc.). - 82 participants to the self-support group increased their ability to identify solutions and to solve with their own efforts, a number of issues that affect their daily life. - 74 children and young people at risk have acquired interpersonal communication, cooperation and teamwork skills. - 7 exhibitions of handicrafts products (made by children and young people of our day center) organized in the local community (in public spaces) have provided excellent opportunities to increase their self-esteem by highlighting their talents: Easter fairs; public exhibits during "City Days"; Christmas fairs and exhibits within the "2% Campaign ". - 180 beneficiaries of the services provided by Stea Association submitted feedback within the biannual evaluation process to examine their satisfaction of about the services they received. The main aspect revealed is that 95% of beneficiaries are satisfied and very satisfied with the services received and encourage all other people in need to seek help form Stea Association. The most popular services were those providing response to basic needs: hygiene, food, medicine and access to health services. In addition, a high degree of utility is attributed to the occupational therapy services, counseling in various domains and mediation for access various services within the community. Through this project we have assumed the role of promoter of an initiative to make a local coalition of stakeholders in social field. 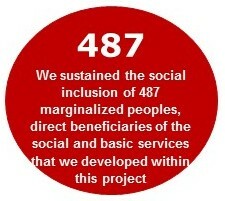 We built partnerships aiming to develop effective solutions and effective support for social inclusion of marginalized peoples. In 2014 we managed to attract in this partnership 30 other NGOs and institutions with activity that is related to social sector and together we created GIPEX - inter-sectoral working group for prevention and combating exclusion of vulnerable persons. This network includes NGOs and institutions in the fields of social welfare, education, employment, labor, police and law-enforcement, judicial, social and medical services, culture, youth and sport. GIPEX’s purpose is to identify appropriate solutions to increase access of vulnerable groups to basic and social services and in the community through an integrated approach of the needs of beneficiaries, in order to prevent and overcome difficult situations. Also, the working group aims to contribute through various types of actions to combate discrimination and promote active citizenship, social solidarity and crystallization of a favorable environment for the NGO sector. 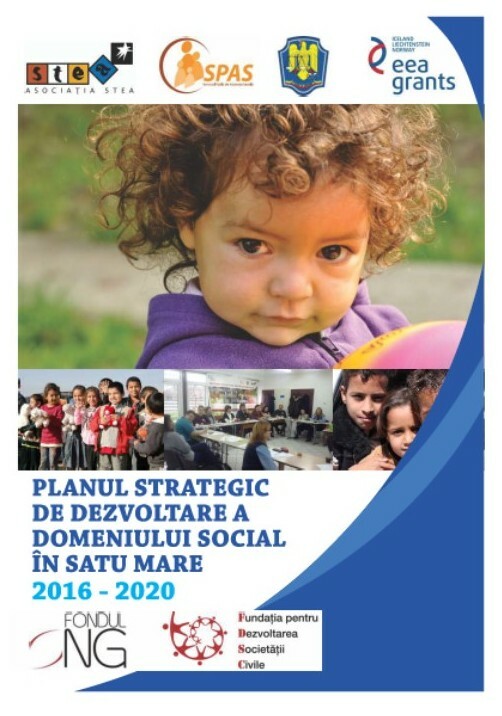 • we built the strategic development plan of the social domain in Satu Mare until 2020. At the community level we have organized together numerous actions, campaigns and events to raise awareness and mobilize people to get involved: anti-discrimination, promotion of children's rights, fundraising for NGO and “2%”, promotion of volunteering and active citizenship. 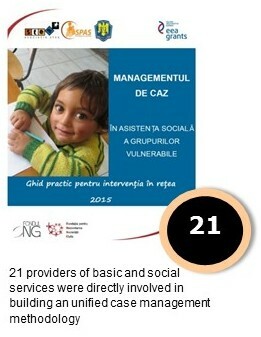 One of the major activities of GIPEX during 2015 was developing and start implementing a unified case management methodology within the inter-sectorial network of basic and social services providers for people in need. · High level of dependence of marginalized people on social assistance, serious mindset problems that are perpetuated also among the younger generations. · Most marginalized adults are accustomed to a lifestyle which greatly hinders their vocational integration. · The individual action of the various stakeholders has a limited long-term impact in sustaining durable social inclusion of marginalized people. 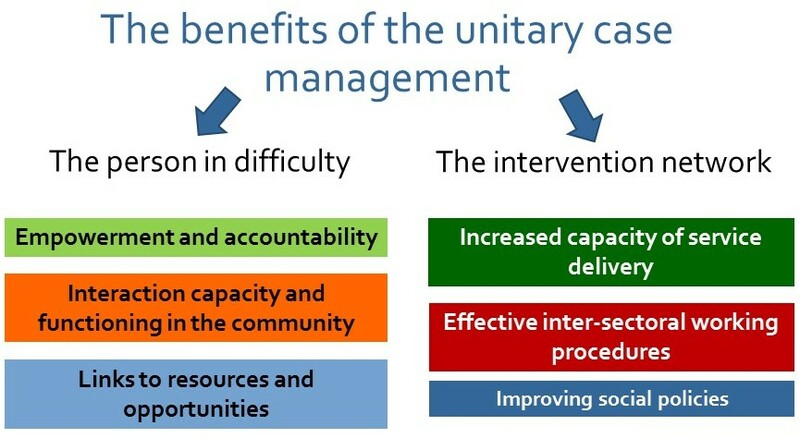 The guide that we developed regarding the unitary case management offers a set of principles designed to guide the work of all the involved parties in this process, it describes the criteria of using the case management, it clarifies the roles and the responsibilities of the institutions and NGOs involved and proposes an efficient working procedure within the network of service providers in order to ensure integrated social assistance of the vulnerable groups. The intervention in network aims to increase the wellbeing of the beneficiary through provision and coordination of high quality services, as efficiently as possible, to solve the problems that hinder his social inclusion. 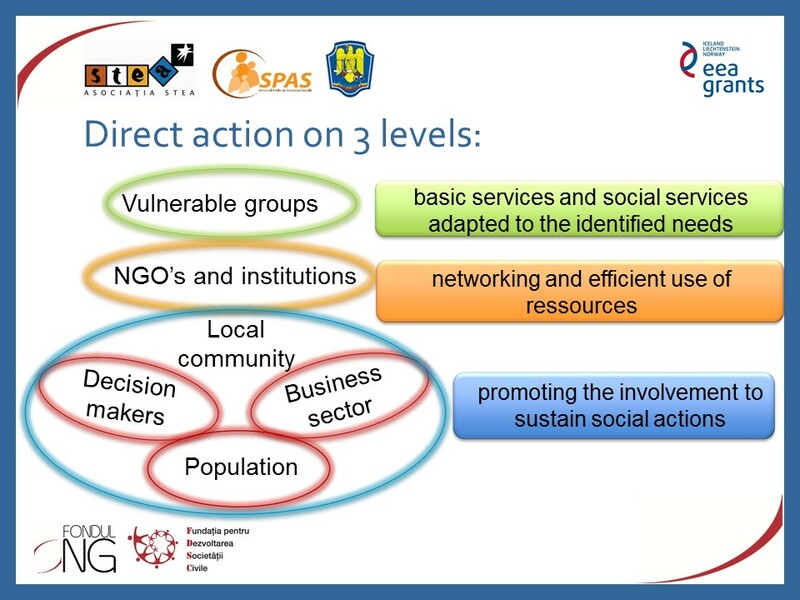 The third big step of the local group, GIPEX’s work, begun in 2015 was the elaboration of the strategic plan of development of the social domain in Satu Mare until 2020. This was a joint effort of most NGOs and institutions working in the social field in Satu Mare, guided by the desire to find locally solutions to solve the problems that socially vulnerable people are facing. The construction of this strategic document had two main components: workshops with representatives from NGOs and institutions to debate and build together each part of the strategy and a social research on "Evaluation of social services, prioritizing service needs, efficient use of resources at local level". The contents of this web page does not necessarily reflect the official position of the EEA Grants 2009-2014. The responsibility for the accuracy and coherence of the information provided lies entirely with the website’s initiators.